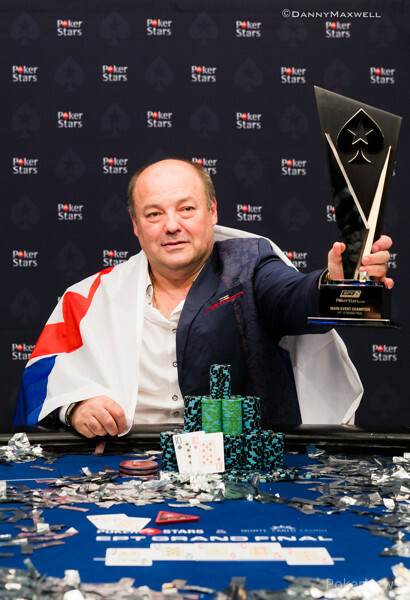 Jan Bendik won the 2016 PokerStars and Monte-Carlo® Casino EPT Grand Final €5,300 Main Event for a staggering €961,800, beating a field of 1,098 players. EPT Season 12 was called the season of the "reg," with all the titles going to already well-established and experienced players. Bendik fit right in with that bunch, with years on the tour, two earlier appearances at EPT final tables, and the title of EPT Player of the Year back in Season 9. On the penultimate day, the final table of eight players was reached, but play continued till the tournament was down to its final six. The two most established names of the final eight made their exit before the day was done, with Italian super high roller Dario Sammartino hitting the rail in eighth and former November Niner Antoine Saout departing in seventh. The final six started out with a big discrepancy in chip counts. You had the haves, with Adrien Allain and Jimmy Guerrero with over 110 big blinds, and the have nots, with around 25 big blinds each. Oren Rosen was the first to go. He had flown friends and family over from Israel to witness him playing the biggest final table of his career, but unfortunately, he had to settle for sixth place when he ran ace-jack into Jan Bendik's ace-king. It took some time for the next player to go, but then they exited in pretty rapid fashion. Pierre Calamusa first hit a pure two-outer with kings all in on the turn against Jan Bendik's flopped trips. The miracle king on the river saved him then, but in the end he would part ways with his stack anyway. He got down to a push-or-fold amount and got it in with ace-four against ace-jack. A jack on the flop ended it all for the rising French star. Calamusa's bust out was after a hand that could have changed the entire dynamic of the final table, when the two chip leaders clashed in a huge pot. Allain four-bet nine-six suited against Guerrero, and the latter made the call out of position with ace-queen. By the time the river was out there, both players hadn't improved, but Allain had all of his chips in the middle anyway. Guerrero was very close to calling the all-in bet with nothing but ace-high, but decided against it, and Allain got away with what must have been the biggest bluff of his career. Allain was in the driver seat after that, though Guerrero was still firmly in second place. Asan Umarov, the Kazakhstani player, who had qualified for this event via a €10 Spin & Go, showcased some craftsmanship today. While he was in for a bargain and was playing on by far the biggest stage of his poker career, he at no point showed to be impressed by the setting, other players, or the money involved. His solid play laddered him up to fourth place, shoving correct hands, and laying down others, but in the end he was short and shoved ace-nine into kings. A board full of blanks later saw Umarov hit the rail, collecting €305,660. Not bad of a return on a €10 investment. In the short interview that followed, he assured the audience he would return to the EPT, but first it was time to celebrate with his family and friends back in Kazakhstan. Down to three-handed play, Bendik gained traction. More and more started to work for him, he won some sizable pots, and was in second place when his two opponents got it in against each other. Guerrero was looking to get back that second-place position when he pushed the action with pocket deuces. Allain wasn't going to throw away his ace-jack and called to put his countryman at risk. An ace and jack on the flop resulted in the one-time overwhelming chip leader departing in third place. It was the Frenchman, Allain, with roughly 22 million heads up against the Slovakian, Bendik, with roughly 11 million. The two played for quite some time when the internet broke down in the entire building and the live stream went out. The issues were resolved when the two returned from dinner break, and the heads-up match continued. The two played mano-a-mano for a bit longer, and Allain was in the lead for most of it before Bendik doubled and the two were back to even. Eventually, it was an enormous cooler that was needed to end it all. Allain flopped a set of eights in a three-bet pot, but the turn gave Bendik a higher set of tens. It got all in on the river and Allain could only stand there in disbelief when he saw his opponent turn over the higher set. Just like that, it all ended. Bendik was the new EPT Grand Final champion, taking home the first-place prize of €961,800. The season started with John Juanda winning EPT Barcelona, followed by Niall Farrell (Malta), Hossein Ensan (Prague), Mike Watson (PCA), and Dzmitry Urbanovich (Dublin) winning titles in an incredible season. The European Poker Tour will return to Barcelona for Season 13 August 16-28, and you can expect PokerNews to be there, so stay tuned. Hand #206: Adrien Allain raised to 525,000 with the and Jan Bendik three-bet to 1,650,000 with the . Allain called. The flop gave Allain a set. Bendik bet 1,600,000 and Allain flat called. The turn gave Bendik a bigger set and this time he checked. Allain bet 1.5 million. Bendik bumped it to 4,250,000 and Allain flat called again. The river was a brick, Bendik shoved, and Allain called, handing Bendik his first EPT title. Hand #196: Allain folded his button. Bendik won it with the . Hand #197: Jan Bendik raised to 575,000 and Adrien Allain folded. Hand #198: Allain and Bendik took a flop of . Bendik checked and Allain took it down betting his . Hand #199: Jan Bendik found and raised to 625,000. Allain called with and the two took a flop of . Two checks later and the hit the turn. Allain lead out for 500,000 and Bendik folded. Hand #200: Allain folded his button. Hand #201: Bendik limped in with Allain checked and they both checked on . The hit the turn and Allain checked. Bendik bet 350,000 and Allain called with his open ended. The completed the river and two checks later Allain took ti down with his queen-high. Hand #202: Allain folded his button, Bendik took it down with . Hand #203: Bendik had the showing and raised. Allain folded right away. Hand #204: Allain raised to 525,000 on his button and Bendik folded right away. Hand #205: Bendik raised to 625,000 with . Allain had just the showing and three-bet to 1.7 million. Bendik folded right away. Hand #186: Adrien Allain made it 525,000 with the and Jan Bendik folded. Hand #187: Jan Bendik limped the and Adrien Allain checked the . They both checked through the board and Bendik took it down with a river bet. Hand #188: Adrien Allain gave Jan Bendik a walk. Hand #189: Jan Bendik gave Adrien Allain a walk. Allain had ace-high. Hand #190: Adrien Allain made it 525,000 with the . Jan Bendik raised to 1,450,000 with the and Allain folded. Hand #191: Jan Bendik gave Adrien Allain a walk. Hand #192: Adrien Allain made it 525,000 with the and Jan Bendik called with the . Allain took it with a bet on the flop. Hand #193: Jan Bendik made it 575,000 with the and Adrien Allain folded. Hand #194: Adrien Allain made it 525,000 with the and Jan Bendik folded. Hand #195: Jan Bendik gave Adrien Allain a walk. Hand #176: Adrien Allain had the button and folded. Bendik received the a walk with five-three. Hand #177: Bendik had and limped in. Allain checked his . Both checked on and Allain bet 275,000 on the turn. The completed the board and Allain checked. Bendik checked behind and took it down. Hand #178: Allain raised his button to 625,000 with and Bendik just shoved all in with . Allain folded right away. Hand #179: Bendik raised to 525,000 with . Allain called with . The flop came and both checked. The hit the turn and another two checks later the completed the board. Bendik bet 400,000 and Allain folded. 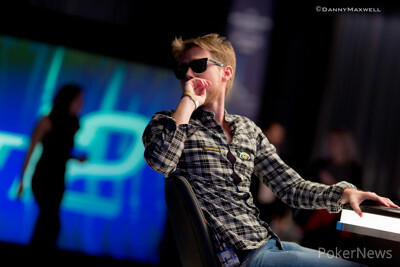 Hand #180: Allain folded his button, Bendik won with nine-deuce. Hand #181: Bendik folded his button. Hand #182: Allain raised to 525,000 with . Bendik folded. Hand #183: Bendik took down the pot uncontested with a raise holding . Hand #184: Allain had the showing and made it 525,000. Bendik called with . The flop came and Bendik check called a bet of 425,000. The hit the turn, giving Bendik the nuts. Allain bet 700,000 into 2 million and Bendik check raised to 2,250,000 and Allain folded right away. Hand #185: Bendik was first to act and limped in with just the showing. Allain checked and the flop came . Allain check called 350,000 with his flush draw and the hit the turn. Both players checked and the completed the board. Allain bluffed at it for 700,000 and Bendik folded right away. Hand #168: Adrien Allain gave Jan Bendik a walk. Hand #169: Jan Bendik gave Adrien Allain a walk. Hand #170: Adrien Allain gave Jan Bendik a walk. Hand #171: Jan Bendik raised to 725,000 with the and Adrien Allain folded. Hand #172: Adrien Allain gave Jan Bendik a walk. Hand #173: Jan Bendik limped the and Adrien Allain checked the . They checked through the board with Allain taking it down holding a straight. Hand #174: Adrien Allain made it 625,000 with the Jan Bendik called with the , then checked the flop. Allain bet and took it down. Hand #175: Jan Bendik made it 725,000 with the . Adrien Allain called with the and checked the flop. Bendick bet and won the pot. Hand #159: Bendik, seated on the button, received and made it 625,000. Allain called with the . The flop came and both players checked. The fell on the turn and Allain checked again. Bendik bet 900,000 into 1,350,000 and Allain folded. Hand #160: Bendik received a walk in the big blind. Hand #161: Bendik limped in with just the showing. for Allain and he raised it up to 750,000. Bendik came back with a three-bet to 1,850,000. Allain played around with his chips a bit before coming over the top with a raise to 4,750,000. Bendik folded right away. Hand #162: Allain raised to 525,000 and Bendik called with . The flop came and Bendik check called Allain's 500,000 bet. The fell on the turn and now both players checked. The completed the board and Bendik bluffed at it with a bet of 600,000. Allain tanked for a fair bit before tossing his cards into the muck. Hand #163: Bendik folded his button, giving Allain a walk. Hand #164: Allain made it 525,000 with and Bendik called with . The flop came and Bendik check called a bet of 500,000. The hit the turn and Bendik checked again. Allain picked up a gutshot and bet 1.2 million into the 2,150,000 pot. Bendik folded the better hand right away. Hand #165: Bendik found once again and raised to 525,000. Allain folded. Hand #166: Allain folded his button. Hand #167: Bendik with the made it 925,000 to go. Allain folded right away. Hand #150: Adrien Allain made it 625,000 with the and Jan Bendik raised to 1,195,000 with the . Allain folded. Hand #151: Jan Bendik gave Adrien Allain a walk. Hand #152: Adrien Allain gave Jan Bendik a walk. Hand #153: Jan Bendik called with the and Adrien Allain checked the . The was checked and Allain bet the turn, forcing a fold. Hand #154: Adrien Allain gave Jan Bendik a walk. Hand #155: Jan Bendik made it 550,000 with the . Adrien Allain folded. Hand #156: Adrien Allain raised the and Jan Bendik called with the . Both checked to the turn on a board. Bendik picked it up with a bet on the turn. Hand #157: Jan Bendik limped in with the . Adrien Allain raised with the and Bendik folded. Hand #158: Adrien Allain made it 525,000 with the and Jan Bendik folded. Hand #141: Jan Bendik found on the button and limped in. Allain checked his suited . The flop came and Allain check folded to Bendik's 300,000 bet. Hand #142: Adrien Allain raised to 725,000 holding and Jan Bendik folded. Hand #143: Jan Bendik limped in with and Allain checked his . The flop came and both players checked. The on the river saw Allain bet 325,000 and Bendik called. The completed the board and Allain bet 600,000 with his "three pair". Bendik folded and Allain retook the chip lead. Floor Kate came in and informed Allain he had been shorted 25,000 during a chip race, and gave him the extra chip. Hand #144: Adrien Allain folded his button, pot for Jan Bendik. Hand #145: Bendik limped in with and Allain checked . Both checked till the river and Bendik took it down with a bet. Hand #146: Allain raised his button to 725,000 with . Bendik folded. Hand #147: for Bendik and he raised to 725,000. Allain folded . Hand #148: Allain raised and Bendik folded. Hand #149: Bendik had on the button and made it 625,000. Allain called with . The flop came and Allain checked. Bendik bet 675,000 and Allain called with his flopped top pair and gutshot. The fell on the turn and Allain checked again. Bendik checked behind this time and the completed the board. Another two checks and Allain won the pot.